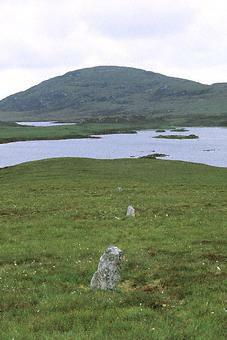 These three standing stones are set almost in a line on the north-western flank of Blashaval (Blathaisbhal), North Uist. In the background, Loch Bheireagbhat, Loch Hungabhat and Maari Hill are visible. The stones, deeply embedded in the earth, are 0.7m, 0.5m and 0.6m high. They are aligned from west-north-west to east-south-east. They are 21m and 35m apart. The name means 'the false men', because according to a legend they were three men who deserted their wives and were turned to stone by a witch. Another legend tells that they mark the graves of three spies.